Welcome to the website of A. Gerits & Son, antiquarian booksellers. Below you will find the list of our specialities. We issue about 4-6 printed catalogues a year, and some 6 to 8 short (20 pages or so) E-Lists. These contain a diverse selection from stock and the most recent acquisitions. Should you wish to receive these catalogues and/or these E-Lists, please go to Contact Us (either use the menu bar or click on the link below) and use the form to request catalogues and/or E-Lists. On this website you’ll find the Bookseller’s Choice: an irregularly updated section where I highlight a particular book from my stock. The Recent Acquisitions will be more regularly updated with new arrivals. 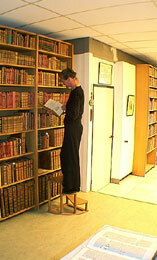 Under Catalogues you can consult the most recent catalogues, under E-List the most recent short lists. Should you have any questions or require any additional information, please go to Contact Us and contact us using the form.